Mircop Ransomware is nothing more than yet another malware that you must avoid at all cost. This is critical since it is a ransomware application and having it running on your PC could and will most likely result in a huge data loss since it will lock your files without any authorization and will ask for a huge ransom for a decryption procedure. If that was not enough, you should also be aware of the fact that it is a major virtual security breach that could attract other potentially malicious programs, which could cause even more unwanted outcomes. To understand how you can safeguard your personal computer from this ransomware make sure to read the rest of this article as our malware experts provide a few virtual security tips. Along such important information, we present detailed removal instructions that will allow you to terminate Mircop Ransomware in a quick and easy manner. 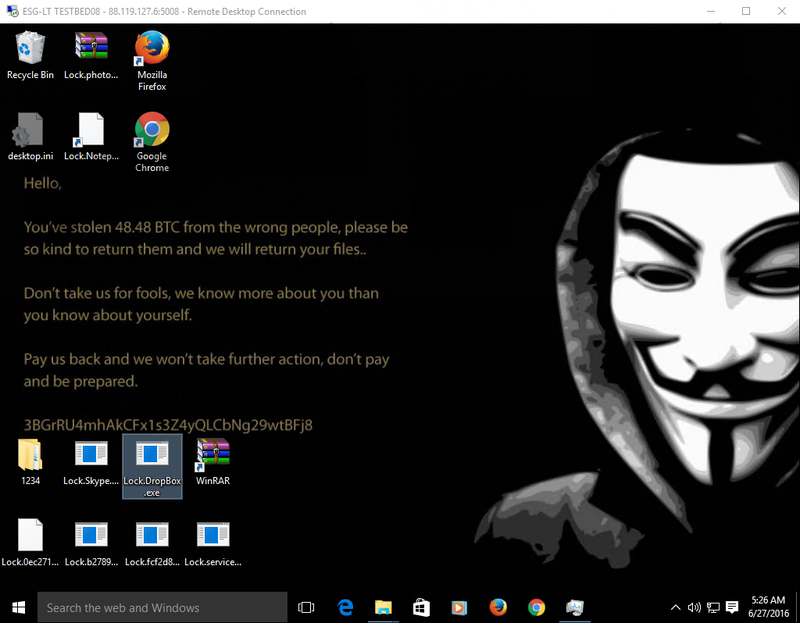 The first indication that Mircop Ransomware is up and running on your personal computer is a change of your desktop image. The new image will inform you about the fact that your personal data has been encrypted, and you will need to pay an enormous ransom of approximately $26000 or 48.48 bitcoins. It is important to highlight the fact that the whole encryption procedure is done in a silent fashion. Meaning that the majority of users will not even be aware of the fact that this intrusive ransomware is active on their PC. Do not waste your money for the decryption process since it is more than likely that you will lose that enormous amount of money because the developers of this malicious program are not obliged in any legal manner to decrypt your files; thus, it is safe to assume that the whole procedure is a scam. While all of this should be more than enough for you to understand why the complete removal of Mircop Ransomware is critical, you must also know that this ransomware program could also be the reason other invasive and potentially malicious application might be able to enter your PC without a lot of trouble. This is so because it could trigger silent connections to the Internet and so could obtain some unknown malware without any authorization. If you value virtual security make sure to delete Mircop Ransomware as soon as it is discovered up and running on your computer. If you consider yourself a security-conscious user make sure to take a few steps to improve your virtual security; it will help you avoid Mircop Ransomware and other similar malicious programs at all times. Since the ransomware in question is distributed via spam e-mail attachments, it is imperative to practice safe browsing habits. You will be able to significantly reduce the risk of infecting your PC with this or any other malicious program by always making sure that the e-mail attachment comes from a known sender. Also, you should avoid any suspicious sites as they could turn out to be hosting malicious software or even worse - could prove to have an arbitrary code execution exploit active on their PC. It is crucial to highlight the fact that just entering such a site that runs this exploit could be enough to get your personal computer infected with some undesirable application. If you do not have a professional antimalware tool active on your Personal computer, do not hesitate to obtain one. Such a tool is paramount to your overall system security as it can detect any devious files within your system or online, meaning that it would prevent any suspicious and potentially malicious downloads, which could result in a system infection. If you successfully take these simple preventative steps, you will be able to maintain a system that is clean and secure at all times. The removal of Mircop Ransomware must be executed as soon as it is found up and running on your PC since it could even be the difference between the amount of data that it encrypts. It is crucial to conduct a detailed analysis of your operating system for potential traces associated with this intrusive ransomware since just a few leftovers associated with it could be enough for it to be silently restored. If you find manual analysis of your computer too complicated make sure to run a full system scan with a reliable malware detection and removal tool as it is capable of detecting and deleting anything associated with Mircop Ransomware in an automatic manner. Find the malicious .exe file embedded by Mircop Ransomware and remove it. Quick & tested solution for Mircop Ransomware removal.